Butcher was born in St Albans, Hertfordshire and started his career with his home town side, St Albans City. He moved to West Ham in 1909 and scored on his debut on 2 March 1910 in a 2–1 away defeat to Watford played at their Cassio Road stadium. He has made over 70 appearances before his playing-time was limited by the outbreak of World War I. 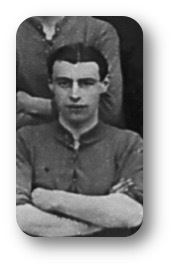 Making 33 appearances in the first season after the end of the war, Butcher made only one appearance the following season before transferring to Luton Town in 1921 where he remained for the next five seasons.